A field trip to the Lienzo de Quauhquechollan is an opportunity to learn more about Guatemala’s history. It tells the story of the conquest of Guatemala from a new perspective, one that is not told in history books. It reminds us that history is dynamic, that our understanding of it can change, and that we always have much to learn about the past. Since the exhibit opened at UFM, the Lienzo has been used by hundreds of teachers as a tool to help their students develop important observation and inference skills. The Lienzo’s information is primarily visual, so students have the opportunity to make their own observations and test their interpretations of what they see. Students also gain experience in formulating questions, engaging their curiosity, and exploring the richness and challenges of a primary source document. Five centuries ago, a storyteller would have explained the Lienzo’s contents to an audience; today an animated video with music and sound effects takes us back into the world of a Quauhquecholteca warrior. A visit to this exhibit emphasizes how technology can be used to understand more about the past. The digital restoration of the Lienzo has allowed specialists new access to this document’s contents by reviving colors, reinstating faded areas, and repairing damage. What makes the exhibit so special for students? 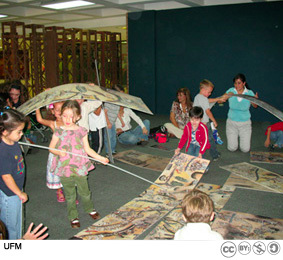 The Lienzo tells its story visually, a narrative device that easily engages young people. The exhibit uses multimedia, an environment young people are at home in. The Lienzo is the earliest known map of Guatemala. When students get a chance to experience it, they realize that maps made 500 years ago were very different from those we use today. They receive a firsthand account of the conquest of Guatemala from an indigenous perspective, not recorded in the history books. 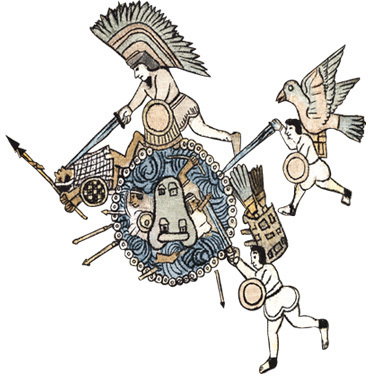 The Lienzo chronicles and illustrates that the conquest of Guatemala was accomplished in stages, through the formation of complex alliances and negotiations. It supplies new details about the conquest, such as routes taken, war tactics, specific battles, and towns that were conquered. The Lienzo has something to offer students of all ages.